Modern research has proven that plant Adaptogens help with the above mentioned imbalances, increase red and white blood cell counts in immuno-compromised patients, and improve exercise tolerance. Adaptogens also help to balance the immune system, the endocrine system, (such as the thyroid, pituitary and adrenal glands) and help protect against infections through their immune-stimulating actions. The word "Adaptogen" was originally a term coined by Russian researchers to describe a class of herbs which help the body adapt to the unrelenting stress of modern existence. These are thought to achieve their effect primarily by supporting the adrenal glands, which bear the brunt of the ill effects of continued stress. Asian Chi Wu Cha Radix Eleutherococci is a natural herbal botanical supplement conceived as a foundation therapy for virtually all endocrine and auto-immune disorders, as stress plays a well-recognized role in the genesis of these conditions. Fatigue is sometimes associated with an "adrenal picture." Especially under emotional strain, the adrenal glands can work overtime. If the stress is prolonged, the adrenal glands can be overcome, or "burned out" to a degree. This can lead to complaints such as lightheadedness upon standing, as well as low blood sugar problems (shakiness, irritability, or headache, when people go too long without eating). As a side benefit, it often helps with insomnia, because Adaptogens can have a calming effect and are thought to build up not only the adrenals, but also to aid in digestion, circulatory tone, and helping to correct various hormonal imbalances. Adaptogens are so generally helpful that it is sometimes said, "When you don't know what to do...take Adaptogens. 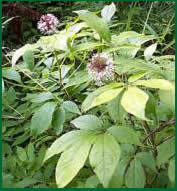 "Adaptogenic botanicals are among the most well studied herbs in the medical literature. They can be thought of as the healthy foundation” of the endocrine system. Indeed, if you were hungry and on a camp out, you could eat potatoes or rice and feel quite well. In a similar way, many health issues can respond well to Chi Wu Cha Radix Eleutherococci. The Chi Wu Cha adaptogen is generally preferred when there is a lot of emotional stress and low adrenal signs. Radix Eleutherococci pure fresh ground root powder grown in Thailand is highly potent & it's mood elevating attributes are felt within minutes. There are no known side effects to the Radix Eleutherococci adaptogen botanical. A few cases of insomnia, arrhythmia (including tachycardia), extrasystole and hypertonia were reported in a clinical study involving 64 patients with atherosclerosis, who received a 33% ethanol extract of the crude drug at a dose of 4.5-6.0 ml daily for 6-8 cycles of treatment (lasting 25-35 days) . In another study of 55 patients with rheumatic heart lesions, two patients experienced hypertension, pericardial pain and palpitations, and pressure headaches after ingesting 3 ml of a 33% ethanol extract of the roots daily for 28 days. Insomnia has also been reported as a side-effect in other clinical trials. In one case report, neonatal androgenization was tentatively associated with the ingestion of Radix Eleutherococci tablets during pregnancy. However, analysis of the raw materials used in the preparation of the tablets (in this study) indicated that they were probably from Periploca sepium. Furthermore, intragastric administration of either Radix Eleutherococci or P. sepium to rats (1.5 g/kg body weight) did not demonstrate any androgenization potential, indicating that the neonatal androgenization was probably not due to the plant material. Radix Eleutherococci should not be used during pregnancy or lactation, or by patients with blood pressure in excess of 180/90mmHg (24/12kPa) . Powdered dried, new 400mg V-caps. Store in a well-closed container, protected from light.